I have been so busy working on the next supplement for Frostgrave, that I nearly missed the release of my new book! Steampunk Soldiers: The American Frontier is a companion to last year’s Steampunk Soldiers: Uniforms & Weapons from the Age of Steam. Like that previous volume, this new book was a joint effort between me, my fellow writer Philip Smith, and the artist Mark Stacey. The heart of the book is the thirty-odd figure studies (including a few vehicles this time) and the associated commentary. Taken together, these give a glimpse into the dangers, the weirdness, and the wondrous adventure of the American Old West during the age of steam. In this case, I think pictures really are worth a lot more than my words, so I’ll let a few of them do the talking! After a short break from fiction, I recently finished off two novels in quick succession. Mockingbird by Walter Tevis is an odd work. I suppose it could be described as either a distopian or post-apocolyptic tale. It has three main characters: a very old robot who seems to be the last 'person' left with any idea of how the world became the way it is, an 'ordinary guy' who accidentally rediscovers the lost skill of reading, and a woman who lives in a zoo with no real animals in it. It is a slow work, and threatened once or twice to become dull, but it always just managed to hold my interested. I'm glad it did as it really picks up near the end, and includes one of the most unexpected, and horrifically understated, admissions I've ever encountered in science-fiction. 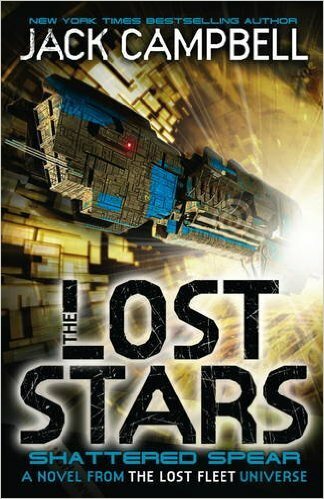 The Lost Stars - Shattered Spear by Jack Campbell, the fourth book in The Lost Stars series, and the 15th (!) book set in The Lost Fleet universe. Well, if you've enjoyed the previous books in the series you'll almost certainly enjoy this one. While this spin-off series never had quite the narrative drive of the original series, it has been an enjoyable enough ride. Although it is not clear, I wouldn't be surprised if The Lost Stars ended with this book (or at least took a break). If so, it will have ended well enough. *If you haven't encountered The Lost Fleet Series before, I can't recommend it highly enough. The best space adventure series I have ever read. Start with The Lost Fleet: Dauntless. So here it is, my author’s advance of Into the Breeding Pits, the latest supplement for Frostgrave! It is due for general release in July. You can currently pre-order a copy from Osprey or Amazon, but you might want to wait a couple of weeks. In June, North Star will be holding another Nickstarter, this time rechristened a ‘Gnickstarter’ in honour of the plastic gnolls that are being released at the same time. The Gnickstarter will be the first chance to order the book along with all of the new minis, as well as potentially pick up a few extra freebies. The book itself is the same format as Thaw of the Lich Lord, a 64 page, full-colour book, loaded with artwork and photos and retailing for £9.99. This chapter talks about setting your games of Frostgrave underground, giving a few ideas and rule suggestions, including a few changes if you are playing in a dungeon style set-up, and new rules for how wandering monsters appear. The real meat of this chapter is the section on traps, which adds a new element of adventure and random carnage to the game! Also, rules for secret passages. This chapter has two major sections. The first part is all about the Beastcrafters, the ancient mages that created strange hybrids in the breeding pits. For those who like a more animalistic warband (or even animalistic wizard) this section is probably for you. The second section includes some new spells, including a new type, ‘Reaction Spells’. In truth, these new spells are probably the biggest single change I have introduced into the game so far. Nothing earth-shattering, but I think they bring a new, fun element to the game. This short chapter introduces two new soldiers, the Tunnel Fighter and the Trap Expert, both of whom have special abilities based on the underground rules. This chapter includes five new scenarios, all set underground, including my new favourite ‘Here Comes the Flood’! Loads of new treasures for your adventurers to find! Highlights include Bear Amour and a Scroll containing a ‘Lost Spell’. The only thing better than more treasure to find, is more monsters to fight, and this chapter contains a bunch of them. There are a few fantasy classics, a few Frostgrave uniques, and a whole lot of gnolls. All-and-all, there is a lot of new info crammed into those 64 pages! I’ve got to admit, I’m a little bit proud of it.